I love being a dentist. Over the years, I have had the opportunity to meet so many wonderful people, and the friendships that I’ve built with my patients and their families are one in a million. It has always been my focus to make each patient feel at home when he or she comes to me for treatment, and I work hard to give my patients the attention they deserve. 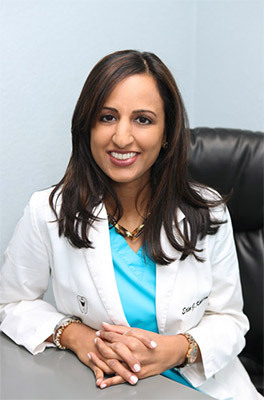 My education in dentistry has provided me with a strong foundation of knowledge and experience. I completed a BA/DDS program University of Missouri - Kansas City, graduating with a bachelor's degree in Biology and a Doctorate of Dental Surgery in 2007. I then returned to my home state of Texas to practice dentistry, before moving to Brevard County in 2008. Born and raised in Corpus Christi, Texas, living in a coastal town comes naturally. My husband and I moved here because we appreciate warm weather and that ocean breeze. We enjoy spending time in various activites with our two young daughters, who keep us busy. I am truly blessed to live and work in such a wonderful community. I enjoy getting to know my patients and their families, and it is such an honor to know that I have made a difference in my patients’ lives. My invovlement in our local elementary schools has allowed me to visit and educate the children in the community as well. I couldn’t ask for a better job or for better people sharing their smiles with me. I look forward to working with you.